After three retreats, I finally finished this Christmas top. Couldn't have done it without Jean Ann Wrights Log Cabin Trim Tool by Creative Grids. Let me use strips of any size as long as they were a little bit bigger than 1 1/2" wide. The fabric I used was a Robert Kaufman Christmas collection - sorry I don't know which one. It's going into my WTBQ pile. I"m thinking of sewing a poinsettia in the white parts and some Holly in the green areas. I'm linking to Finished or Not Friday, Can I Get a Whoop, Whoop? and Oh Scraps!. Have a wonderful weekend. Wow Angie, that looks so pretty. Both your ideas sound great and it's hard to decide. You could always quilt them on with a beautiful thread. Hugs. Such pretty green fabric in this, and gives your quilt a lot of depth. Is this one a keeper? I think poinsettias in the white would be beautiful. Maybe a gold thread or something with a little sparkle even? I have the same CG ruler, but now I want to follow all the way through and do a quilt instead of just blocks. You might have distracted me with this now. Your Christmas quilt is lovely. I love the idea of quilting poinsettias in the white centers. Enjoy your day. Log cabins are a favorite of mine, and this one is definitely a beauty. 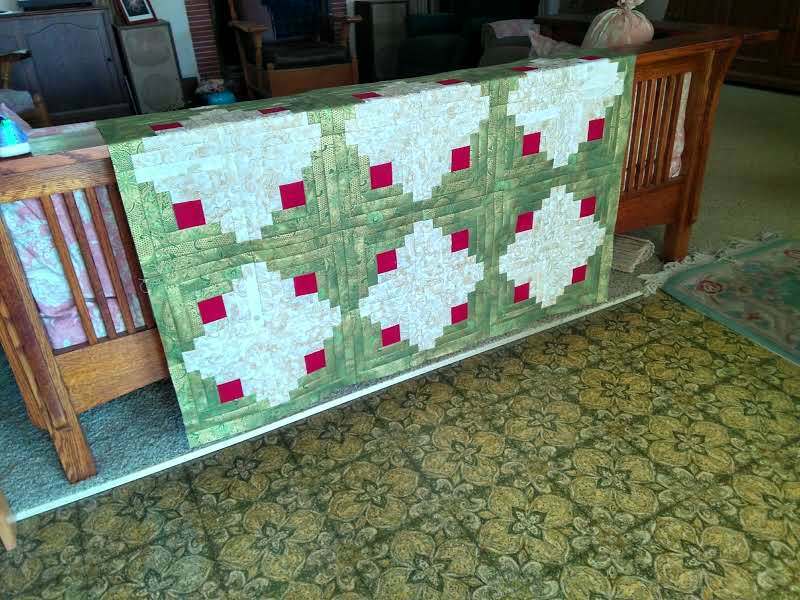 It would look pretty with the poinsettias quilted in, but whatever you do, it's still going to be a beautiful Christmas quilt.